Test for water in oil with our Hydroscount Analyser System! HydroSCOUT is a field portable test that quantifies water concentration in a variety of matrices, (oil, paint, solvents, liquid waste, soil, inks, etc). HydroSCOUT can quantify water content in two ranges for used oil, 0 to 20% and 10 to 100%. Designed to be used on-site, Clor-N-Oil is a fast, accurate method to test electrical insulating fluids for the presence of PCB. Each pocket-sized kit contains everything necessary to perform the test in less than 5 minutes. CLOR-D-TECT 1000 provides a “go, no-go” result at a level of 1000 ppm chlorine. Ideal for use by oil transporters, generators and facilities that recycle or re-refine used oil can incorporate Clor-D-Tect 1000 into their management of waste oil to prevent costly hazardous waste from being mixed with non-contaminated oil. Clor-D-Tect Q4000 under USEPA SW-846 Method 9077 to determine quantitative chlorine levels in used oil. Our Dexsil Titra-Lube TBN test kit measures Total Base Number, (TBN) in lubricating oil in Diesel Engines. PCB/Clorinated Organics Testing for Dielectric Fluid, Soil, Water and Surface Samples. 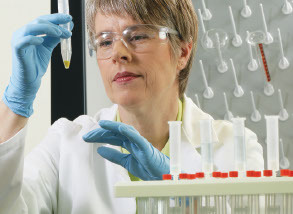 Quant-N-Ol is an on-site test for quantifying alcohol in gasoline. This fast, easy-to-use test allows regulators and gasoline distributors to test for the presence and percentage of alcohol in gasoline, on-site, with safe non-toxic reagents in less than 2 minutes. Our Dexsil Titra-Lube TAN measures total acid number in oils such as lubricating, hydraulic, pump and other oils.